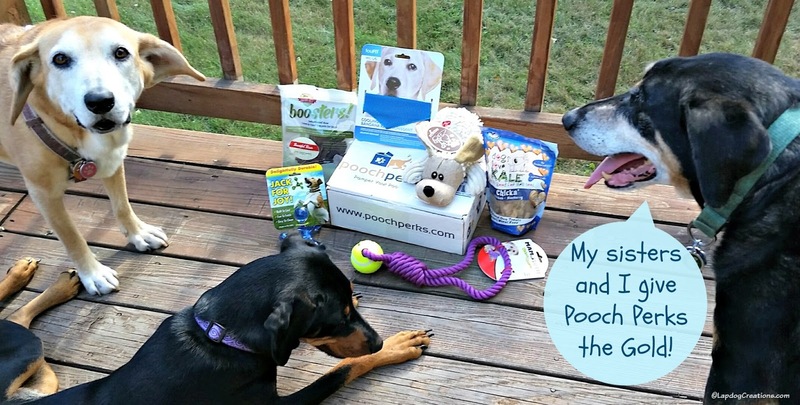 Disclosure: Pooch Perks sent an August box to Lapdog Creations, free of charge, for review purposes. We only share information that we feel is relevant to our readers, and all opinions expressed are our own. If you click on my affiliate link and subscribe, I may receive a small commission which does not affect your costs at all. You may recall our introduction to Pooch Perks through the Barnyard Party and Fiesta boxes in the spring. Then, we told you about our land-fishing experience with the Finding Dory box (Teutul is still thrilled that he didn't have to get wet for that fishing trip). If you read those reviews, you know that one of the things the Lapdogs' Mama loved most about Pooch Perks is the fun themes they come up with. August was no exception. As we're all tuned in to the exciting action from Rio, our dogs can join in with their Olympic Essentials themed toys and treats. What a super fun box of goodies. The Lapdogs give Pooch Perks the gold medal in Synchronized Dog Subscription Boxing! Their Mama thinks the gold is well deserved too. Pooch Perks not only offers some fantastic toys and treats, but they truly set themselves apart from the competition by offering four different package options! You decide which option fits your budget and your household. The box we received for review is the Pampered Pooch option. I often hear from other multi-dog households that they don't do subscription boxes because "there's not enough stuff" inside. For our 3-dog household, the Pampered Pooch option is truly a perfect fit. If you have more than 4 dogs, I would suggest ordering two boxes. Signing up for Pooch Perks is easy - you don't have to run a marathon or balance on a 4 inch wide platform! 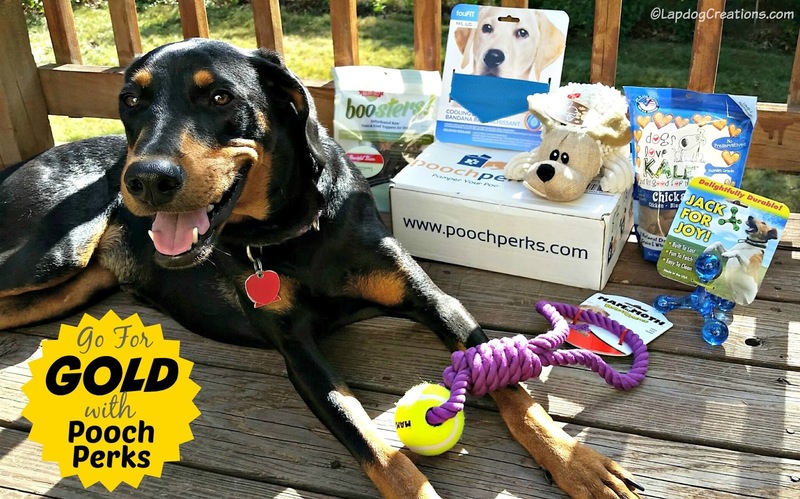 While Pooch Perks does not offer a multi-month price break, you can SAVE 10% off a single box or a 3, 6, or 12- month subscription with coupon code LAPDOG or click on the affiliate link/photo to the left to save 30%! Are you ready to sign your favorite pup up for Pooch Perks? We can't wait to hear what you think! Looks like a great box! I like how this one has different options. It looks like you'll all be busy while the peeps watch the TV. Very nice selection in that box. What a great selection of toys and treats. I'm sure the Lapdogs always have fun reviewing their boxes! 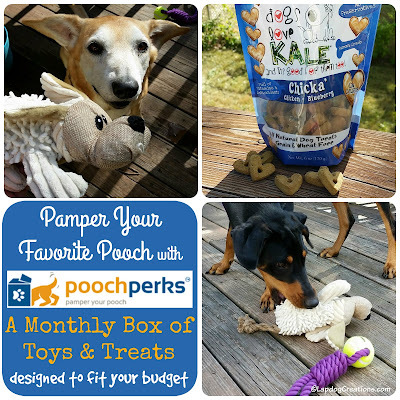 We loved our Pooch Perks box this month too! They always have such great themes and selection. That box looks like a lot of fun! There are some nice toys in there. Looks like a great assortment of things. Subscription boxes are so popular and I can definitely see why. This looks like a great one! I love the name Pooch Perks! Also, love that you can customize the box based on dog size. 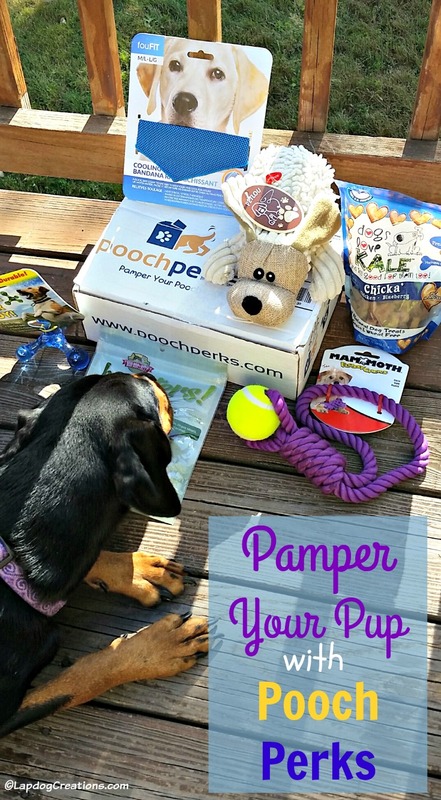 This box subscription looks great and loaded with a ton of treats my dogs would love! Interestingly, I have not heard of them before! Thanks for sharing! I'd say this box deserves Gold too! Great stuff in this one. This looks like a great subscription box, you guys got lots of fun stuff! Pooch Perks looks like a great subscription box! I currently have Bark Box come once a month but Pooch Perks has SO many cool items including that bandanna. it's super cool - glad to be introduced to something new! This box looks like so much fun!It comes with a lot of items too. Some boxes only come with 2-3 items. I can see why your dogs give this first place! I like the range of size AND prices. This would be a great gift for a dog over for a Birthday wouldn't it! Easy to see why this box gets gold. Kilo the Pug would be pretty happy with most of that stuff, especially the treats. I'm sure my pack would LOVE that box. As a pet parent, I appreciate the options! Looks like a wonderful box with great products! This looks like a great selection of treats and toys! Even though my dogs don't care if their toys have a theme, I get a kick out of it! We love the subscription boxes for cats, too. We just don't have the extra money at this time to pay for a monthly subscription.